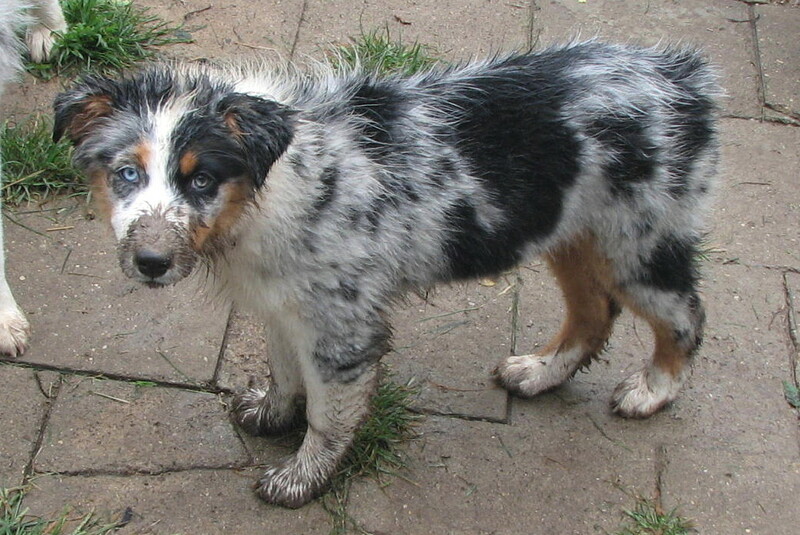 Faithwalk Aussies - "No, No, Bad Dog"
"My Name is No, No, Bad Dog"
This first series is of a 3 month old puppy who was let out of the house after a big rainfall, for a brief potty break. She managed to do this to herself in just a few moments. Thankfully the others didn't follow her lead. "Hi, my name is No, No, Bad Dog!" 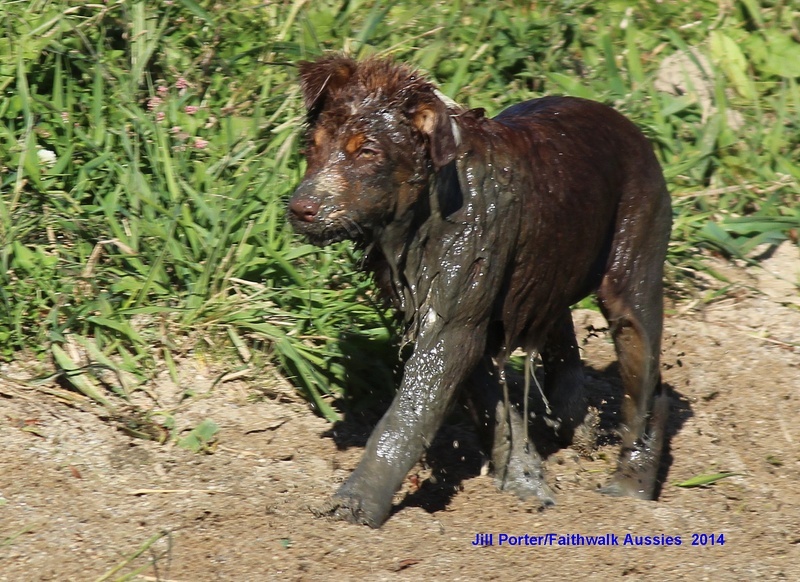 Above and below, this puppy couldn't just play in the pond, she had to get as coated in mud as possible! "I just wanted to help you paint the house. 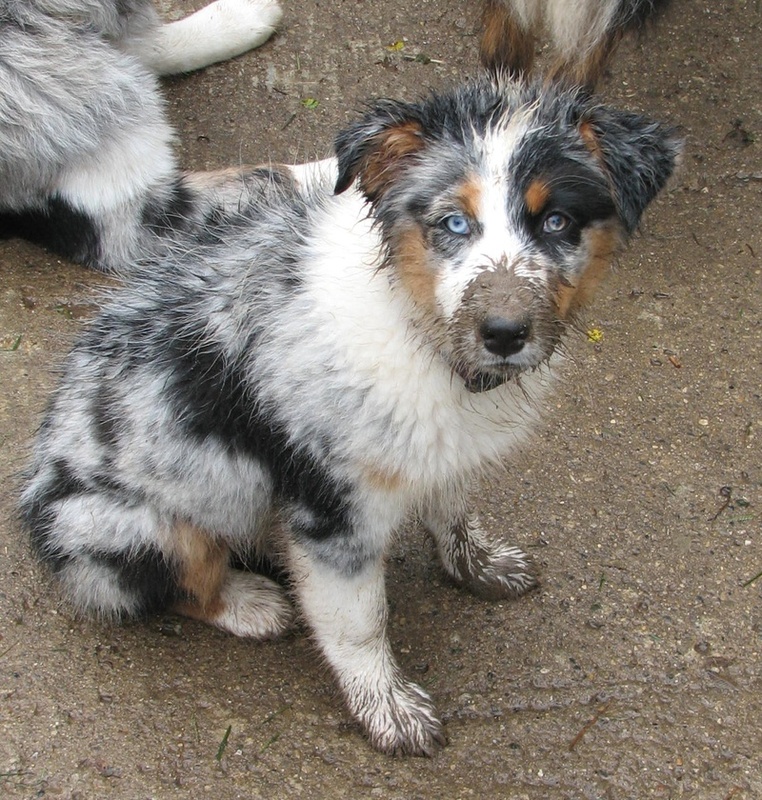 I thought it would be neat to look like those merle Aussies too, so I put blue all over me!" The picture says it all! I had just gotten up from a clean chair and this is what I came back to. 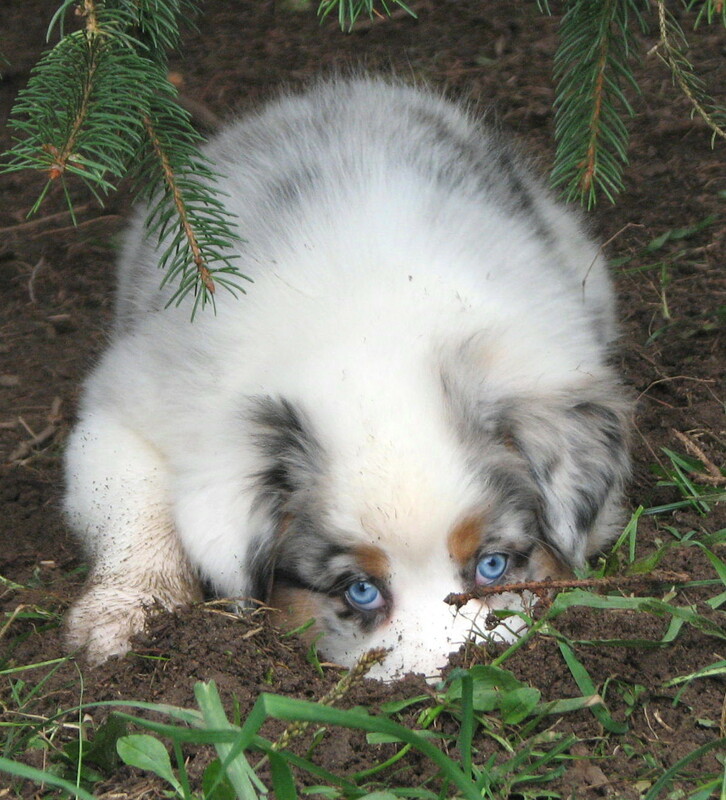 Dirt is yummy! It's so easy being GREEN! "We really TRIED to be good but there were just too many other options." "I didn't mean to do it!" 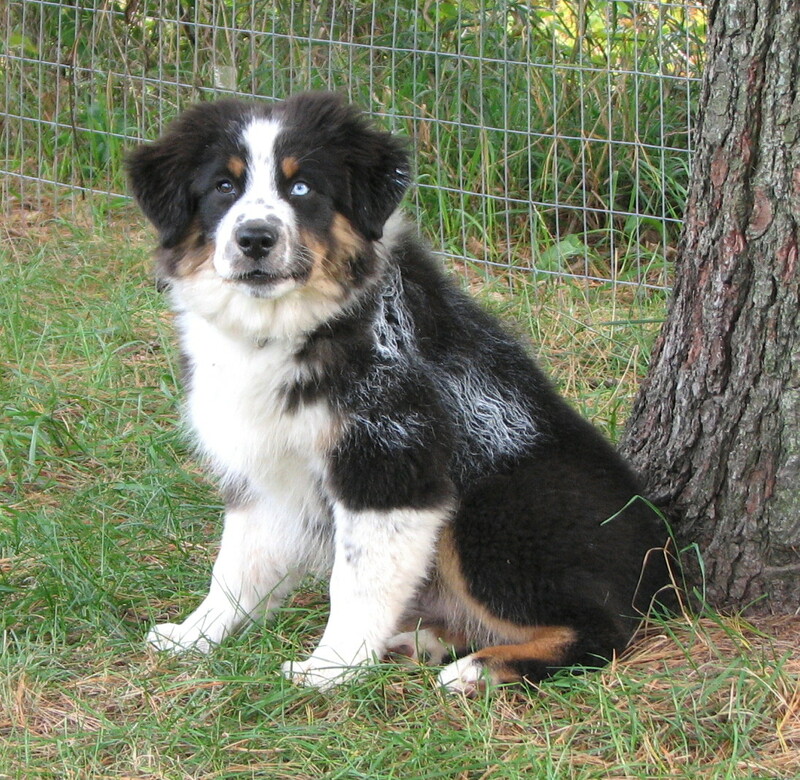 These two pictures came from the owner of this "pretty" blue merle female Billie. 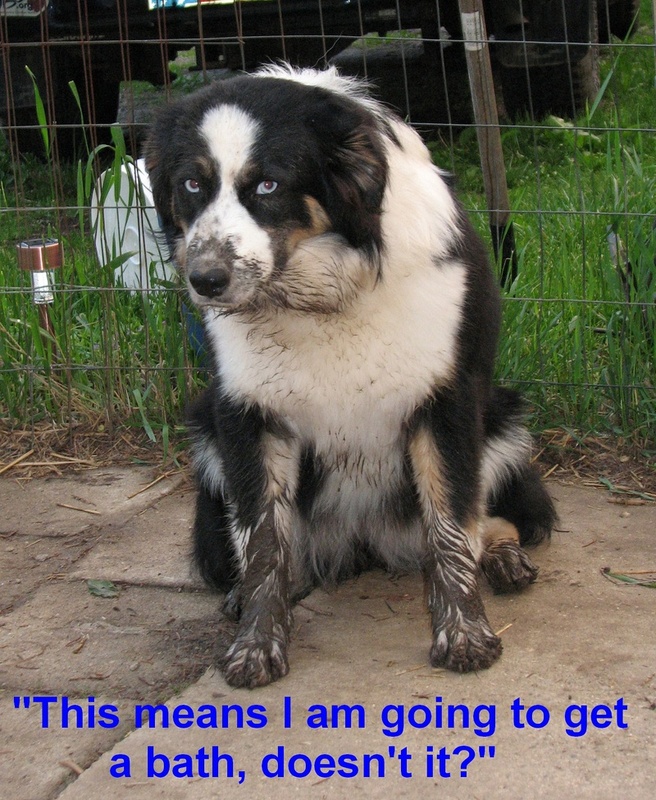 Billie had just been given a bath by her owner, and went out and rolled in the sand. She is on leash waiting for ANOTHER bath. 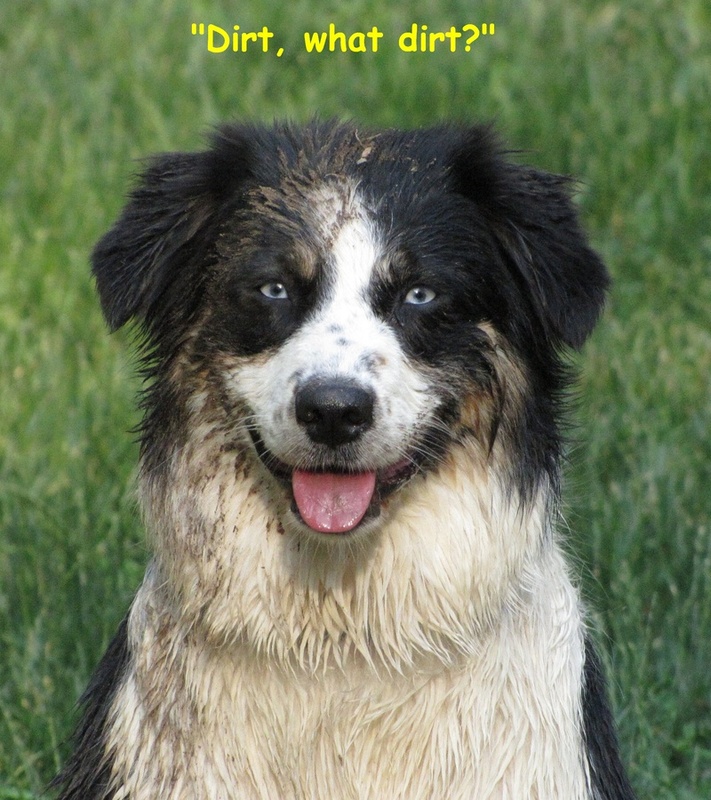 I can't tell if her expression is just resignation at the prospect of another bath, or just a little bit of satisfaction in the joy that she had getting dirty again! 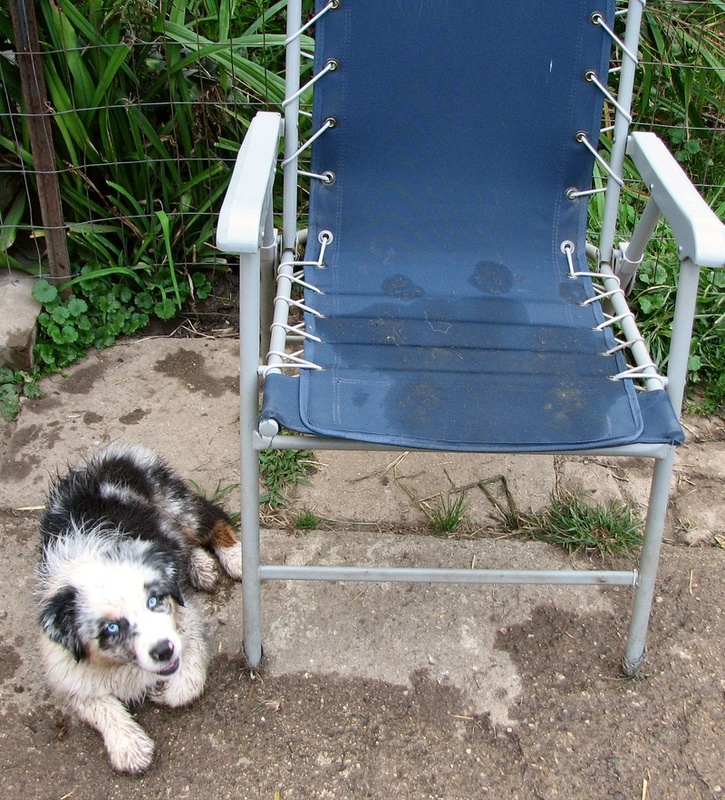 You have to have a sense of humor to own an Aussie! 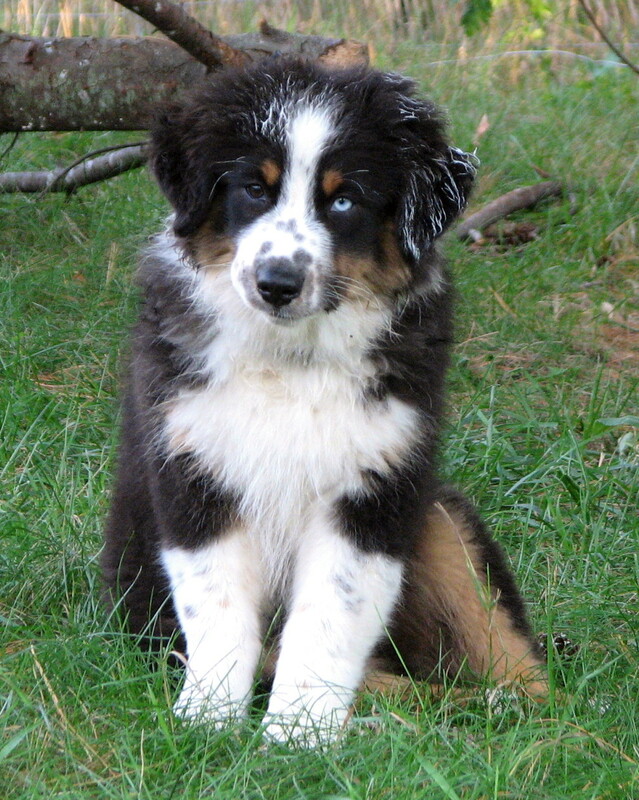 There is a special school that almost every puppy will attend at some point during puppyhood. It's call "No, No, Bad Dog!" School. It's at this school they learn to hone their instincts to dig, chew, bark, howl and generally do all the most fun puppy antics. 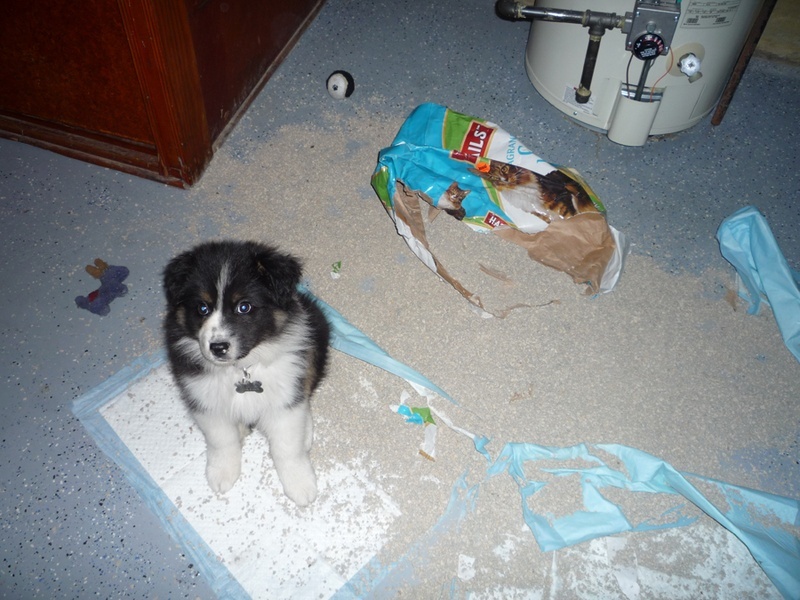 They practice every day in class with their puppy friends, and then come home to show you what they have learned. Below are a few "No, No, Bad Dog!" School puppy class attendees and alumni. 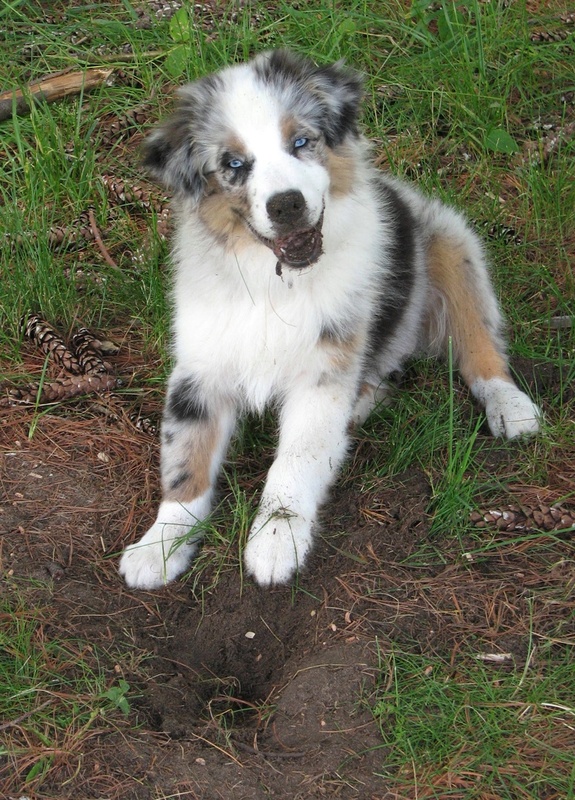 "Maybe if I lick the dirt off they won't notice the hole we dug." This puppy is in Chewing 101 and doing well! The dog above is a "No, No, Bad Dog!" School alumni. She graduated at the top of her class! In the picture below, her brother also graduated with honors, though he lives in another state! This talent must run in the family! Rumor has it their brother Quest is pretty talented in this area as well. Another important skill is to act innocent no matter what you have just done or what evidence there may be. This girl has this talent in a big way! Below another puppy joins the club! 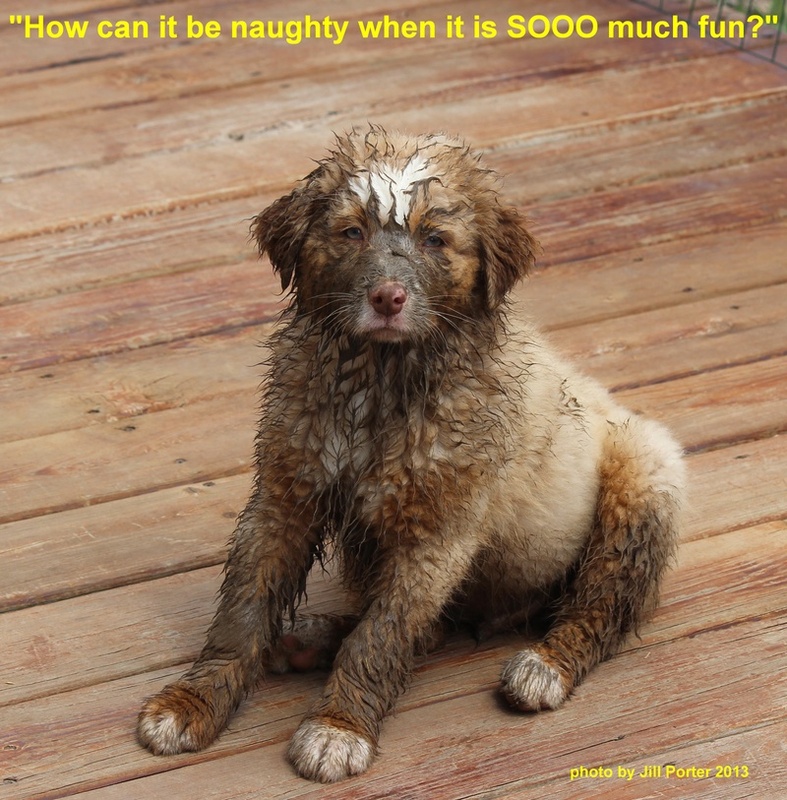 No, No Bad Dog School is not just for puppies learning to get dirty, but also for puppies who want to get into other mischief. Below are two puppies killing a nice bathroom rug. What great fun! 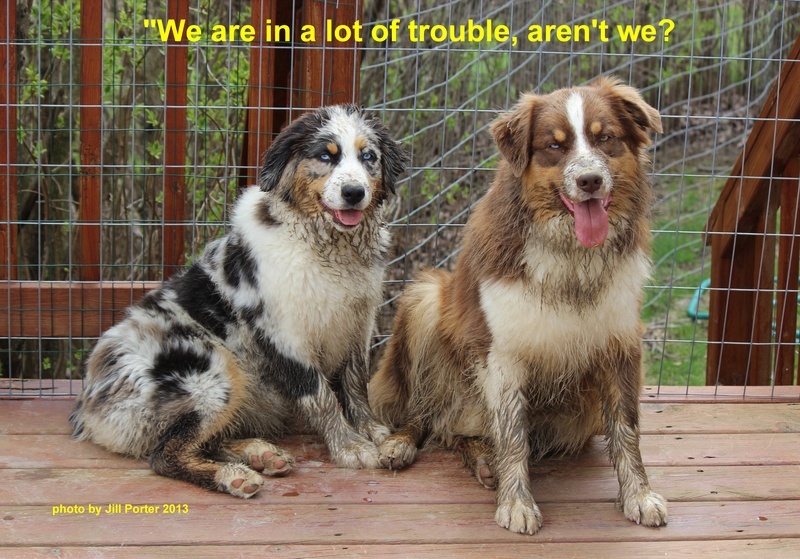 A couple blue merle puppies after one of our hose parties. They found dirt! "Rejoice in the Lord always, again I say, rejoice!"